Making a living as a farmer? In a commentary titled, "A Farmer's Double Life," in the new edition of Tufts Nutrition, my Friedman School colleagues Jennifer Hashley and Samuel Anderson reflect on whether it is right or wrong that most small farmers also rely on off-farm income. While they’d love to scale up to be full-time farmers someday, they know that it will take years to reach that point. In the meantime, they need to keep an off-farm job in order to maintain a livelihood, like the two New Entry graduates who farm their leased land but also work 30 or more hours a week as certified nursing assistants. Many may not have full-time farming income as a goal in the first place, instead seeking to farm parttime for supplementary income and to contribute to their local food system. Perhaps the American small-scale farmer is most often a part-time farmer—but is that necessarily a problem? The commentary reminded me of a tweet this week, torn between desire to encourage young people in farming and concern about the dubious income prospects. As always, it's useful to bring some real numbers into the discussion. It is widely recognized that national average farm income statistics can be misinterpreted, because they intermingle such diverse farms of all sizes. 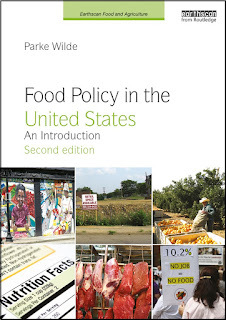 Fortunately, USDA provides a helpful typology. Residence farms: Farms with less than $350,000 in gross cash farm income and where the principal operator is either retired or has a primary occupation other than farming. Intermediate farms: Farms with less than $350,000 in gross cash farm income and a principal operator whose primary occupation is farming. Commercial farms: Farms with $350,000 or more gross cash farm income and nonfamily farms. 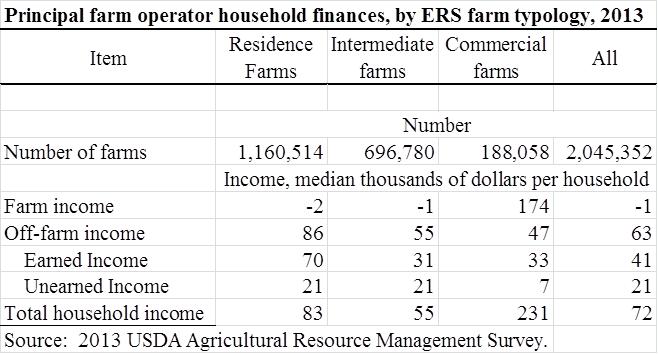 In my rough summary of the USDA data using this typology: (a) "residence farmers" get by with non-farm income, (b) "intermediate farms" with annual farm revenue less than $350k have it most rough, and (c) "commercial farms" with annual farm revenue greater than $350k do well with farm income. Somewhat in the spirit of Hashley and Anderson's commentary, I find this income table realistic rather than highly distressing. Many small farmers may find they need off-farm income to get by. If you want to go into farming full-time -- whether organic, conventional, or something in between -- it is good to contemplate your capacity for reaching close to the commercial scale in the third column. New reports by the Center for Public Integrity and the Center for Science in the Public Interest suggest that some food ingredients have been falling through the cracks, with nobody in authority confirming that they are safe [slight edit 4/21]. By law, the federal government has long accepted food ingredients that are "Generally Recognized as Safe" (GRAS), without the need for elaborate testing. For example, GRAS rightly allows long-accepted ingredients such as vinegar to be used without unnecessary testing procedures. The new reports note many examples where ingredients that are classified as GRAS have been allergenic, have been suspected of being carcinogens, or never were submitted for FDA review (becuase such review is sometimes optional). In some cases, ingredients were submitted for FDA review for consideration as GRAS, and then withdrawn because FDA had questions, but these ingredients ended up in the food supply anyway. Critics of the system say the biggest concern, however, is that companies regularly introduce new additives without ever informing the FDA. That means people are consuming foods with added flavors, preservatives and other ingredients that are not at all reviewed by regulators for immediate dangers or long-term health effects. Overall, most food safety officials with the companies involved quite probably are mostly confident the food ingredients are safe for most people (especially those without allergies), and felt it would be overkill to subject the ingredients to a large volume of testing. In most cases, the companies probably are correct. In such cases, though, let's stop calling such food ingredients "GRAS." From now on, more truthfully, let's call new ingredients that lack FDA review: Sometimes Considered as Mostly Safe " (SCAMS).